My first read of this book was in November 1983. This review is based on a quick re-reading of my highlighted portions of the text and my margin notes. 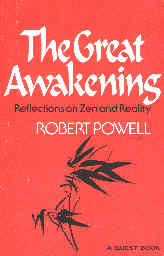 Powell acknowledges that his book is about Zen and Krishnamurti. Here's a quote from K.: "The mind is its own prison." If so, the only escape from such a prison must be "no-mind," the achieving of which state is the goal of Zen. Powell says, "the self-realized man lives from the centre of his being -- and being, at once the source and its manifestation, he is free. He lives in a state of creativity, inspiration, love; it is this love Christians denote by the word agape'." If any of these above ideas or concepts seem obscure or confusing or downright wrong to you, get hold of this book and let it get hold of you. You may not be convinced by the end of the book, but the act of reading is like putting the ingredients into the soup pot: let it cook for thirteen years and then, taste the soup. It will like "kissing the Joy as it flies, and you will live in eternity's sunrise."